Of the ten films nominated for the Best Picture category in the 2014 Academy Awards, Philomena was almost certainly the least prominent during the awards season. None of the actors were front runners for their respective categories, neither was director Stephen Frears and the low key nature of its subject matter meant it wasn’t really on the cards to get a look in for music, costume or anything else. In many ways, the film is not far removed from its star Philomena Lee. Quiet, introspective and not wanting to cause a fuss. We know the story of Philomena Lee thanks to the somewhat relunctant journalistic endeavours of Martin Sixsmith who is out of work after being unceremoniously dumped as a political advisor to the Labor Party. He aspires to return to work by writing about his passion – Russian history. At a dinner party, a caterer suggests he write a human interest story about a woman who is looking to reunite with her estranged son. Sixsmith initially scoffs at the idea but eventually relents. It is then that he is introduced to Philomena Lee. Lee’s story is a sad and incredulous. In the Fifties, she met a young man at a carnival and fell pregnant to him. Her father sends her away at to the Sean Ross Abbey in Ireland where she is put into manual labour by the nuns. Her son Anthony is kept at the premise but she is only allowed to visit him for strictly monitored one hour sessions. It is effectively a prison sentence. One day, without any notice and without her consent, the nuns send Anthony away to a family who adopt him. Fifty years later, in present day, Sixsmith agrees to help Lee look for Michael. They are stonewalled and given no assistance by the nuns at Sean Ross Abbey who insist their records were lost in a fire. However some sniffing around at the local tavern yields some promising leads and eventually, Sixsmith uncovers that Anthony may have been taken by an American family across the Atlantic. I won’t spoil what happens when they travel there but it becomes clear that whether Philomena finds Anthony or not isn’t really what the film is about. Instead the film explores the philosophical differences between Sixsmith and Lee. Sixsmith is an atheist. He is academically brilliant, full of self confidence and angry at the church for their treatment of Lee and other women like her. Lee on the other hand is a simple soul, still a practising Catholic and at times, she still seems mentally beholden to the nuns at Sean Ross Abbey. Even when they don’t budge to help her look for her son, she is polite, respectful and keeps her composure. The film comes to a head in a final scene when Philomena Lee, Martin Sixsmith and the head nun from the Fifties, Sister Hildegaard, who was responsible for sending Anthony away, meet at the abbey. Sixsmith, full of indignant bluster, loses his composure and shames the nun for her actions. Sister Hildegaard, for her part, remains unrepentant. She scolds Philomena and ‘girls like her’ for falling pregnant out of wedlock. It is Philomena who is the voice of reason and the level headed one in the exchange. She sees no value in remaining angry or bitter at Sister Hildegaard. She offers forgiveness and wants to move on with her life. She also strengthens her own resolve and after initially waivering on the idea of having her story told, she decides the church’s actions should be shared publically, and she gives her consent to Sixsmith to publish the book about their investigation because “people should know what happened there”. Philomena is a surprisingly affecting and moving film. 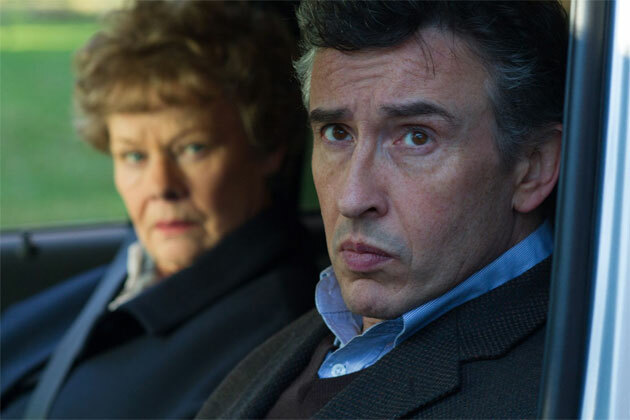 Steve Coogan and Judy Dench are excellent as Martin Sixsmith and Philomena Lee respectively and the film hits all the right notes in blending humour and drama. Philomena Lee’s story is a tragic one but the film finds the scope not just to tell the tale on its own merits but invites the audience to consider their own values, spiritual beliefs and prejudices. Watching the film, I shared most of Sixsmith’s observations about Philomena and the church and was right there with him when he began berating Sister Hildegaard for what she had done. But Philomena’s incredible generosity in forgiving the nuns and pragmatic view on enjoying the time left in her life without being consumed by anger had me reconsidering my viewpoint when I thought I had all the answers. For this reason, I found Philomena to be a clever, thought-provoking film that provides nourishment for the soul. Summary : An accomplished, low key film that uses both humour and drama to tell Philomena Lee's sad story. Don't overlook it this Oscar season.